Sponsors: Sponsored by NBC, MSNBC, the Democratic National Committee and Drexel University. Candidates: Sen. Joe Biden, Sen. Hillary Clinton, Sen. Chris Dodd, former Sen. John Edwards, Rep. Dennis Kucinich, and Gov. Bill Richardson participated. [former Sen. Mike Gravel excluded]. Moderator: "NBC Nightly News" anchor Brian Williams, joined in questioning by Tim Russert, moderator of "Meet the Press" and NBC News Washington Bureau Chief. Audience: 750 people attended the debate, and 250 seats were reserved for Drexel. Drexel distributed tickets for both the live debate and for a debate watch party by random lottery held on October 23 by the University Student Government Association in collaboration with Student Life and the Dean of Students. Broadcast: Live on MSNBC, streamed live on MSNBC.com and re-broadcast on Telemundo in Spanish. Format: Two hours; three ad breaks. 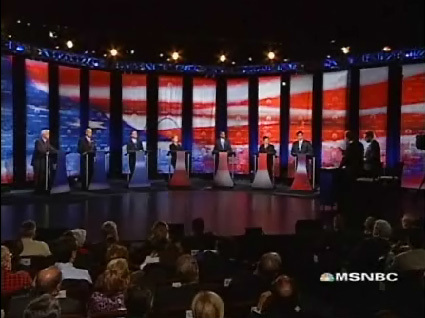 As the debate went on there were lightening rounds with 30 second responses. Background: The fourth DNC-sanctioned debate. 65 days to go until the Iowa caucuses. The debate seemed to veer a bit off track towards the close, with questions on UFOs and Halloween costumes; perhaps, as Brian Williams said, it was the effects of the late hour and a hot room. The Dodd campaign's "Talk Clock" again showed a substantial time imbalance: Clinton 22.01, Obama 19:09, Edwards 16:32, Dodd 9:36, Richardson 7:50, Kucinich 7:25, Biden 6:07 and Williams/Russert 18.26. NBC News political director Chuck Todd informed the campaign of former Sen. Gravel that he would be excluded from the debate in a phone call at 4:55 pm on Friday October 19. Gravel charged "corporate censorship" and arranged "an alternate Democratic debate" at the World Café Live (3025 Walnut St.).